With Ambassador, Kubeflow manages routing easily with Kubernetes annotations. 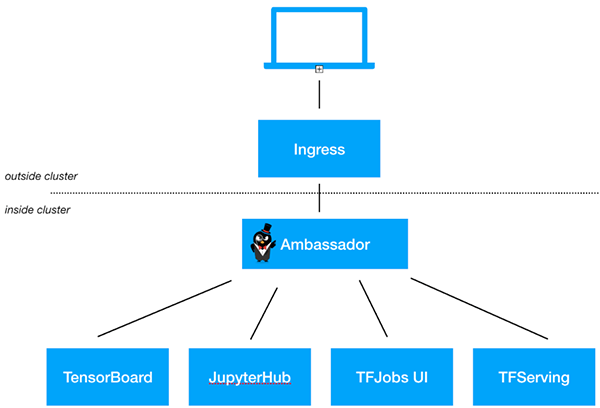 Kubeflow configures a single ingress object that directs traffic to Ambassador, then creates services with Ambassador annotations as needed to direct traffic to specific backends. For example, when deploying TensorFlow services, Kubeflow creates and annotates a K8s service so that the model will be served at https:///models//. Kubeflow can also use the Envoy Proxy to do the actual L7 routing. Using Ambassador, Kubeflow takes advantage of additional routing configuration like URL rewriting and method-based routing.